Highland’s Kaleb Phillips tallied 19 points in his team’s win at Cardington Friday. Cardington’s Garrett Wagner goes up for a long-range shot in action from Friday. 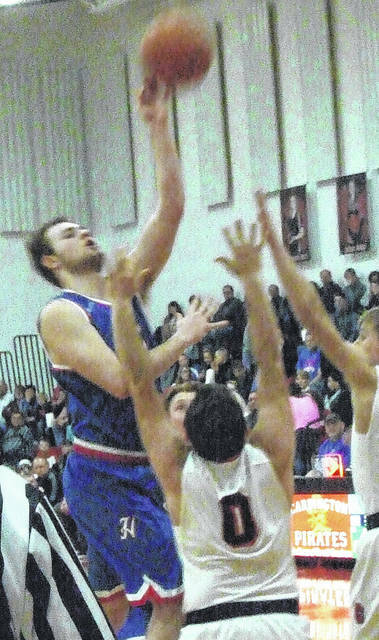 Highland was able to use their size advantage over Cardington to good effect Friday night when the visiting Scots claimed a 66-44 win in KMAC action. While three-point shooting kept the Pirates in the game in the early going, the Scots were able to hold them to single digits in both the second and third periods as they pulled away for the win. In the opening period, the Scots got seven points from Mack Anglin and four from Chase Carpenter, but Trey Brininger, Garrett Wagner and Brandon Steckel all connected from long range for Cardington to keep the score close. It was 11-10 in favor of the Pirates with just under a minute remaining in the quarter, but a bucket by Carpenter and three-pointer from Anglin staked Highland to a 15-11 lead going into the second period. Baskets from Daniel Kill and Wagner got Cardington within a 16-15 margin early in the second quarter, but Highland’s defense held them to four points over the final 6:30 of the first half. During that time, the Scots picked up their pace offensively. Seven points by Chris Branham boosted them to a 24-17 lead. After Wagner hit for Cardington, the Scots finished the half with a flourish, getting three buckets from Kaleb Phillips and one shot from Anglin to lead 32-19 going into the intermission. Cardington’s offensive troubles continued in the third quarter. They scored first in the period on a basket by Avery Harper, but then went nearly four minutes without any points. During that time, Anglin scored four points and both Andrew Wheeler and Phillips added baskets to boost Highland’s lead to a 40-21 score. For his part, Powell was happy with his team’s play in the second night. After a recent loss at Mount Gilead, he noted his team needed to work on extending early leads and not letting opponents hang around — something he felt his players did against Cardington. The Scots were able to maintain a sizable lead in the fourth quarter, going in front by as many as 28 points as they improved to 13-5 overall and 9-3 in league play. Powell noted that with a lot of tough teams in Division II of the Central District, his team needs to continue playing well heading into the tournament. Both Anglin and Phillips scored 19 for the Scots, while Cody Holtrey added 10. 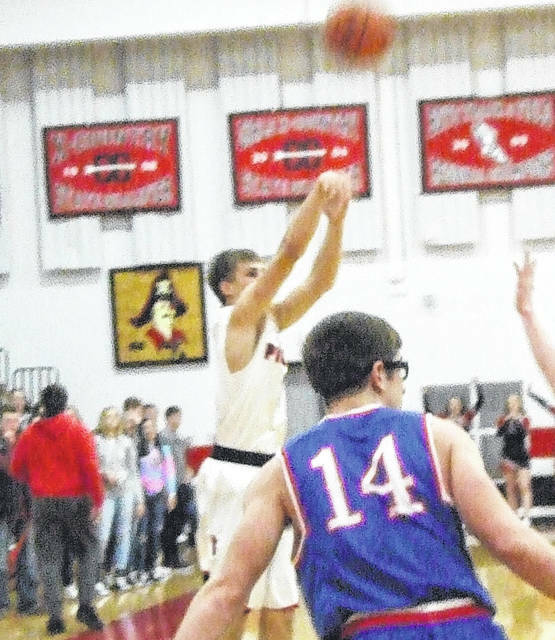 Cardington got 15 from Wagner, who connected on three three-pointers, while Brininger scored eight.